Are you ready to take a dip into serious job-hunting or are you making baby steps and is still unaware of some opportunities awaiting you? We all have to admit, it is not easy getting the right job for us, or having to fit in to a certain job that is available for us. Well at least some have been blessed enough to land in good companies and have managed to stay for long comfortably, which is very true to those specially who came from prestigious schools. 'prestigious universities,' but to be frank, it was not fun at all. Though in the school where I came from, we were properly equipped with informative know-hows on how to apply to a certain company having the confidence that you will be considered and even hired. We would even have job fairs on our football field (the then Football field) or on the gym, where hundreds of companies would line up and get your resumes and info. I would still remember coming home with all the company profiles, application sheets without even understanding why I would want to be part of a certain company. It all boils down to just filling the need to get a job! Isn't that why we studied college in the first place? 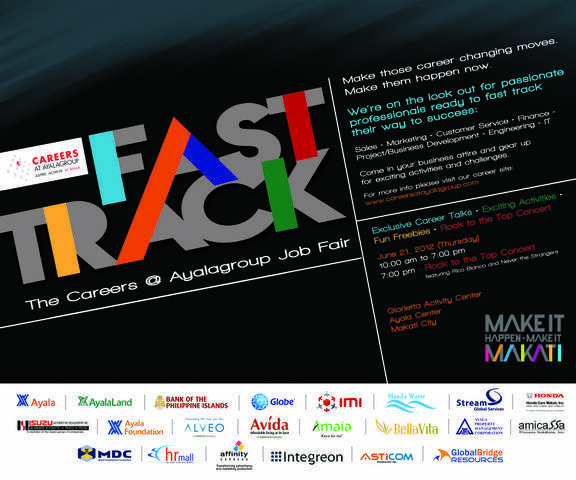 But here is an exciting and groundbreaking avenue where a better way to make this happen than just providing “jobs” but career opportunities through the 1st Ayala Group Job Fair (FAST TRACK: The Careers @ Ayala Group Job Fair). 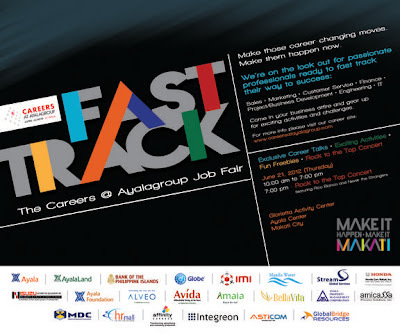 On June 21, 2012 at the Glorietta Activity Center, Ayala will be opening doors for more than 2000++ career opportunities within the conglomerate. Career opportunities span from various industries like: Real Estate, Banking, Telecoms, Water and Waste Water Works, Electronics, Automotives, BPOs, Utilities, Investments, Facilities Management, Construction, Hospitality and Non-Profit Foundation. So be at your best in business attire, armed with a open mind and a positive attitude and of course with your resume at 10am to 7pm. Expect a different way of getting hired, prepped up with on the site career talks, fun ways of knowing more about what Ayala could offer in terms of contributing to Filipino career jumps and freebies from the companies involved. Here is a sneak peak to what you could expect at the fair. Moreover, this Ayala initiative is also consistent with Makati’s on-going campaign of “Make It Happen, Make It Makati” which is all about creating opportunities for all to live, shop, be entertained and work. At very least, you'll be stretching your creative muscles, expanding and diversifying your contacts, and making yourself a more well-rounded and interesting person—all huge boosters to any job search. Will tell my nephews about this, it's today right? I hope they could do it again .